A vehicle owner can save on dealership prices on keyless entry remote and keys for his/her car with incredible bargains offered by Auto Transponder. 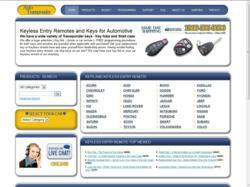 This company is one of the largest online sellers of keyless entry remotes for cars and trucks. We have a huge inventory and 99% of the car related products are readily available and shipped on the same day. And that's not all. We also provide free programming procedures for keys and remotes, whenever applicable with your purchase. Auto Transponder, the reputed online dealer in keyless entry remotes for cars and trucks, helps you save on dealership prices. Auto Transponder helps vehicle owners keep pace with technological advances with their varied products. They supply keys, key fobs, shell case, clicker, car keyless remote, car chip keys and replacement keys. You not only save on dealership prices but also keep pace with the continuous technological overhaul in the automobile industry. Auto Transponder products are always designed according to the changing trends. Very often, there are vehicle owners who don’t have a clue about the keyless remote technology. For them, as well as for most other car owners, buying a keyless entry remote can be an extremely frustrating process. With Auto Transponder buying various products such as auto keyless entry, car remotes and Nissan key fob, becomes an easy and pleasurable experience. Auto Transponder is one of the largest online sellers of keyless entry remotes for cars and trucks. The experts at Auto Transponder take all hassles away from vehicle owners. Clients just need to inform them about the model number of their car and the keyless entry remote is delivered to them.